Vote for StatCounter! – Statcounter Blog. Following on from Aodhan’s recent win at the ICT Excellence Awards, we are delighted to let you know that ‘the man behind StatCounter’ has now been nominated for a BusinessWeek Young Entrepreneur Award! As this award is based on an online poll, we need YOU to vote for Aodhan and StatCounter now! Update: Voting has closed. Thank you all for your support of StatCounter! Results will be announced next week. One of the rare free services that ‘thinks’ as a user ‘for’ the user. And finds solutions that benefits both ways. Ingenius. Thanks so much! That’s exactly what we try to do – think like users for the users! Congrats, and congrats to everyone there! Excellent service, you deserve the award. Congrats, and congrats to everyone at statcounter! Australia was a bit far to get to the pub though. Stat counter is such an incredible site. Sorry that I did not get to vote. StatCounter is a select function that does a great job, and for free ! The only way it could be better is to do a huge amount of advertizing for users for free. Congratulations Aodhan! 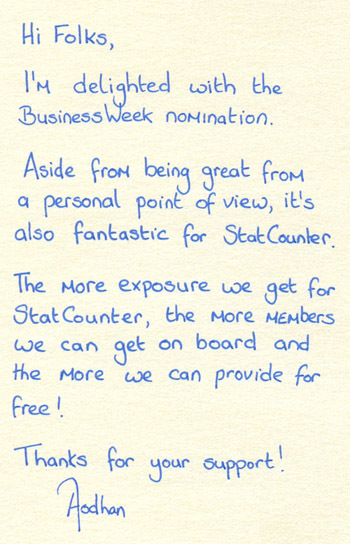 I voted for you, and I love statcounter – it’s a great service. I wish I could be in Dublin to celebrate with you all, but I live in New York, and it’s quite a far hike over the “pond”! Best to you now and always! Just voted. Hope you win! You provide a great service.